It’s kind of like a semi-permanent tattoo for your eyebrows! Unlike a regular tattoo, it is a form of pigmentation that is implanted under your skin with a manual, handheld tool instead of a machine. The “artist” who does your eyebrows will draw hair-like strokes with the tool to mimic the natural hairs in your brows, but they can also enhance the shape and fullness of them as well (this is the main reason I got them done). I just wasn’t satisfied with the results I was getting from filling in my eyebrows every damn day. 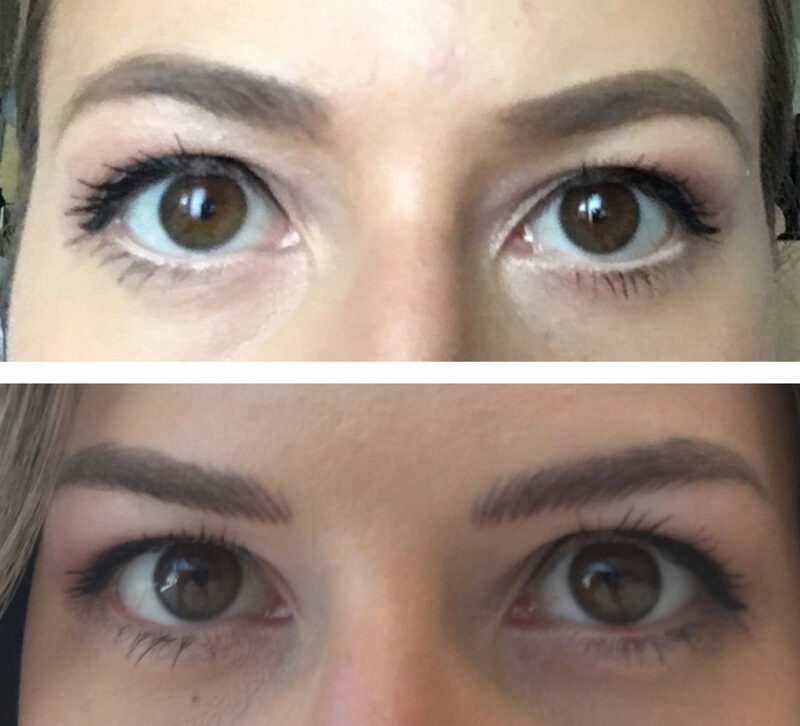 The results from microblading last 8 months to a year! 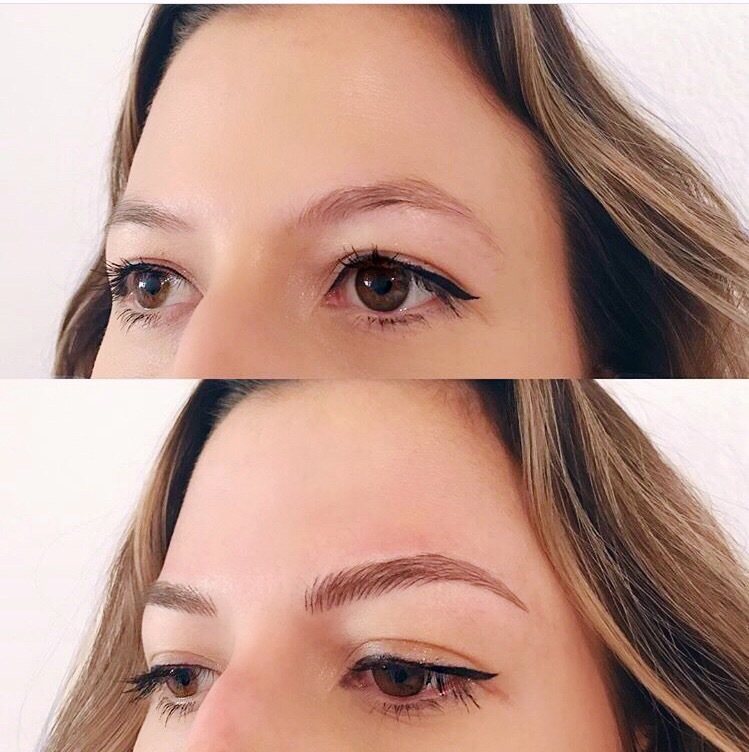 When I went to my first appointment with Paige of @inkandblush, she sat me down and basically outlined where my “new” eyebrows would be. Basically she used the symmetry of my face and the angles of my nose/eye/cheek bones to determine the best shape, width, and length. She had me check to make sure I liked the outline of them in the mirror. I was surprised at how much my eyebrows needed to be angled up a bit more at the ends, but I trusted her “drawing” lol. Top: Before eyebrows filled in. After: Microbladed eyebrows not filled in. SO much more natural! She kept applying numbing cream as she went though, so it was probably only 1-2 minutes of pain. Once she finished the thick strokes, she had me sit up to finish the rest of the strokes. The first appointment probably took 1.5 hours and the second only an hour. Paige gave me a cream/serum to put on my eyebrows after the first session to help them heal. I just took a tiny bit with a Q-Tip and applied it for the weeks morning & night following the session. It kind of made me break out and she put it in this container that isn’t labeled so I didn’t like that I didn’t know what was going on my face lol. 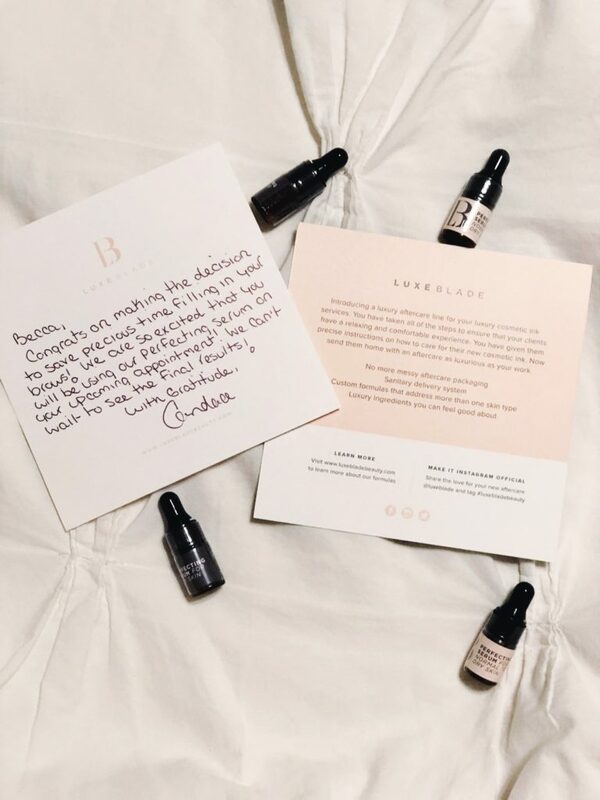 For the second session, I had been sent an all-natural serum from LuxeBlade (see below) that’s made specifically for microblading aftercare. It’s basically a combination of grape seed oil, black cumin seed, vitamin e, and evening primrose that are rich in antioxidants and essential fatty acids that nourish, calm, and deliver light moisture. I have superrr sensitive skin so I was happy to see that their serums are hypoallergenic, paraben free, gluten free, and cruelty free. 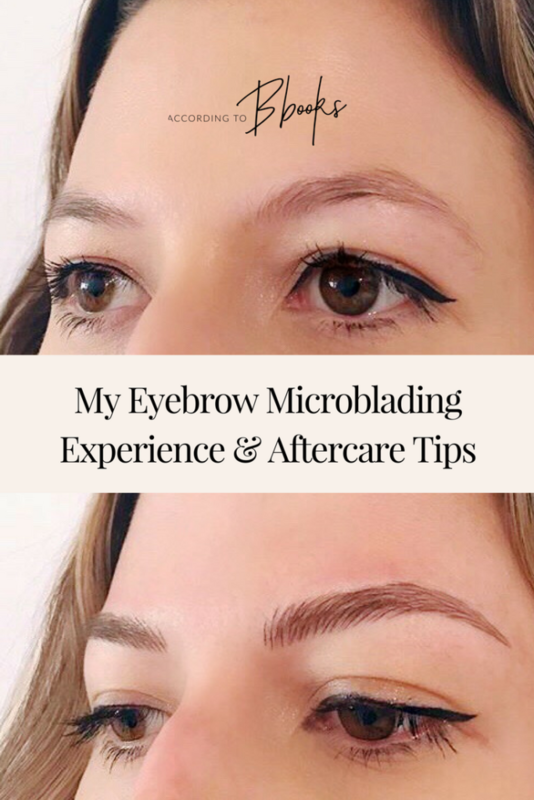 The LuxeBlade serums I used for my second microblading session aftercare. The LuxeBlade serum came in these adorable teeny tiny bottle with a teeny tiny eye dropper. They say to use 1-2 drops of the serum 1-2 times a day and it made the skin around my eye area sooo soft. Seriously guys my eyebrows look AMAZING. Paige couldn’t have done a better job. There is a weird period when your eyebrows heal between the 1st and 2nd sessions where they get really dark for a day or two and then they peel and fade significantly. After the 2nd session, I had her go just a little bit darker with my ink (I like the bold look) and they healed better and darker. The worst/best part of the whole thing is that you can’t workout for literally 7 DAYS after each session. You also can’t get them wet or sweat at all so showers are a little frustrating. If you’re getting your eyebrows microbladed soon, to ask whoever does them to see what they recommend for a post-care serum. I really liked the LuxeBlade because of it’s ingredients and easy applying with the tiny eyedropper. They have serums for dry or oily skin too! And it’s $4!!!! So worth it. Also, I would consider going a shade or two darker for your second session when you go back. 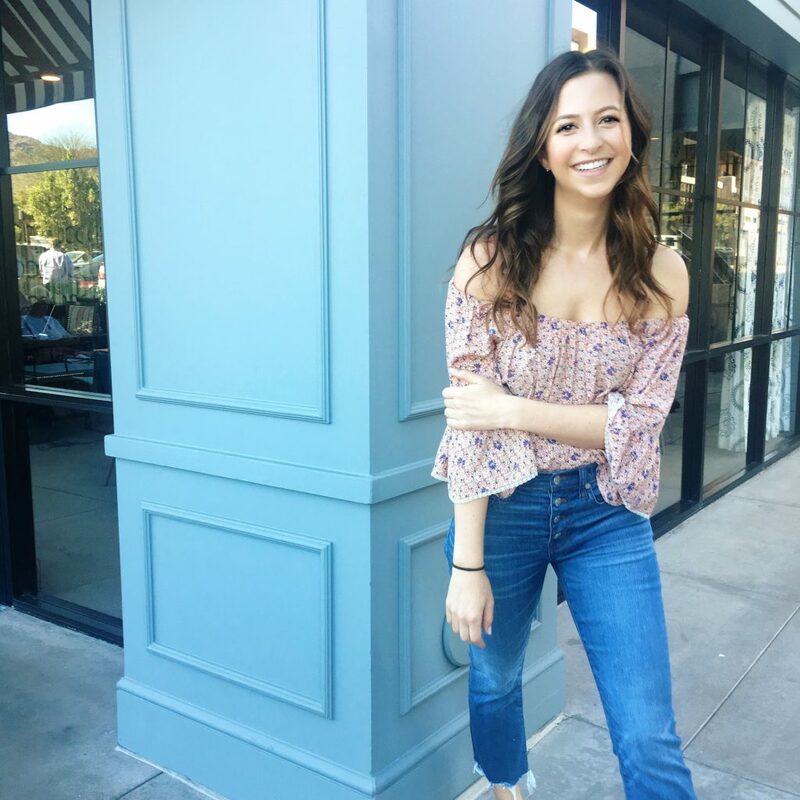 If you liked the shade the first time, go a little bit darker the second time so you can have a bolder look that lasts longer! Wow, your brows looks perfect. I had my micro blading done 2.5 weeks ago, with no peeling yet at all. The wax paste is great. I’ve been experiencing intermittent severe brow pain that extends from my nose, most especially between my eyes, around my eyes, up to and including my eyebrow bone. My right eyebrow has little muscle spasms or twitches too. What could be causing that? Thank you!! I love how they turned out. That’s so strange – did she just use a standard technique?? Your brows are very pretty. Where do you get this treatment, and what is the cost? I got them done by @Inkandblush in Mesa, AZ. I don’t remember the full price – think it was around $375 for the first session and $50 for the second.